Welcome back today #2 sneak peek of Taylored Expressions August release. Yesterday’s post was Day #1 sneak peek. 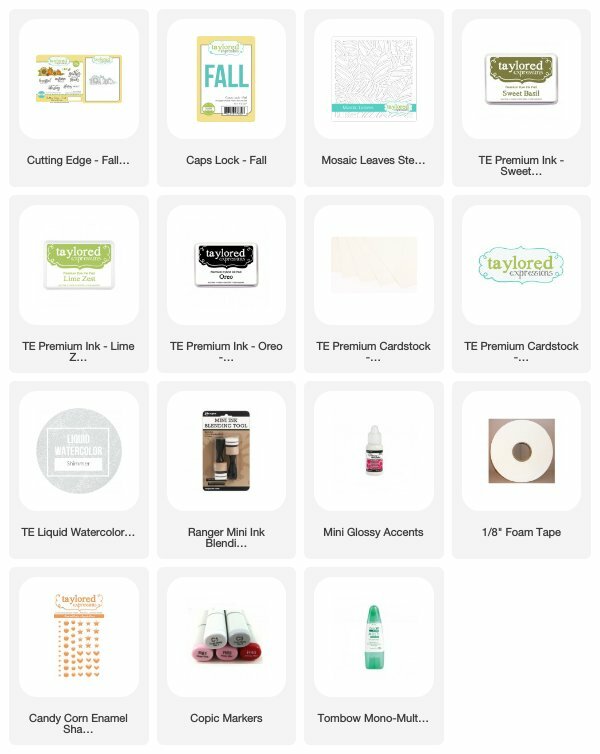 All the new release products are Fall and Halloween themed. So make your wish list for the season. Today I have two projects to share. 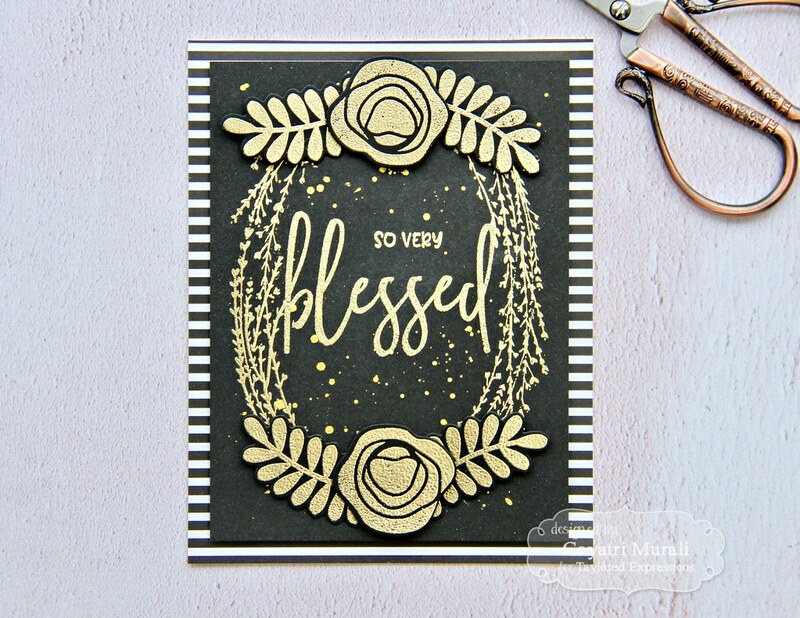 The first one is a gorgeous dainty wreath stamp set called Rustic Wreath paired with sentiment from new So Many Thanks sentiment set. I went for classic colour combination – black, white and gold. 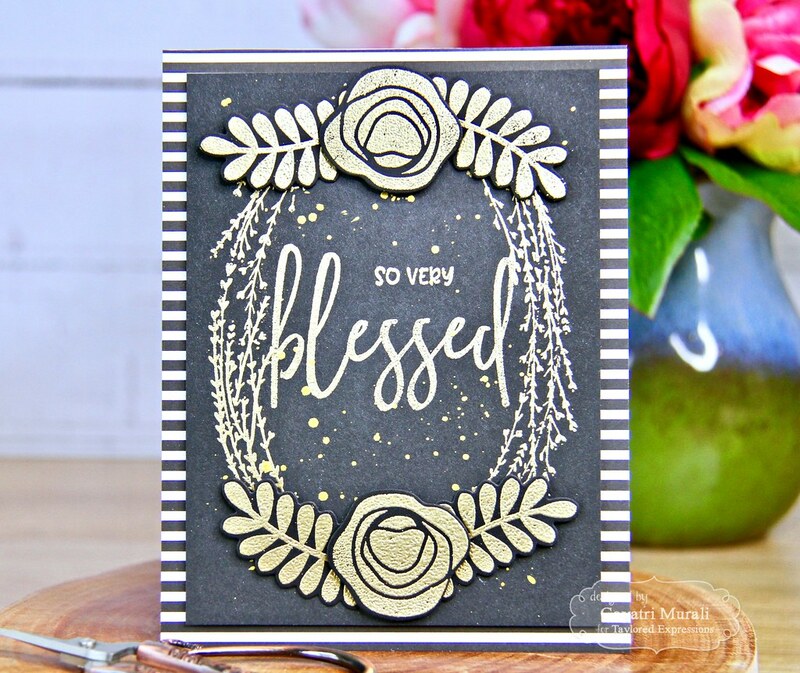 I gold heat embossed the rustic wreath image on Oreo card stock panel using TE detailed gold embossing powder. Then the sentiment from So Many Thanks stamp set gold heat embossed in the centre of the wreath. I spattered some gold spray from Heidi Swapp and left the panel to dry. 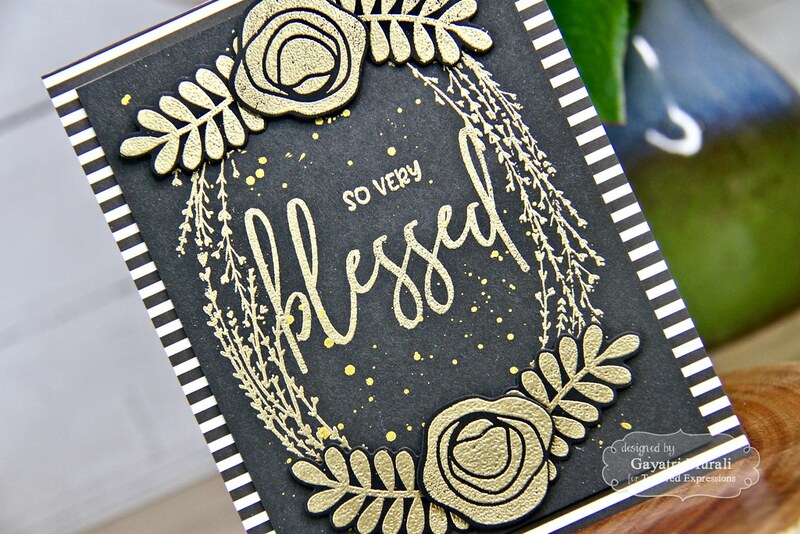 I used an older Fresh Floral stamp set to gold heat emboss the flower and leaves image on Oreo cardstock and die cut them using the coordinating die. I made two clusters and adhered on top and bottom centre of the wreath using foam adhesives. On the card base, I trimmed and adhered the black and white striped pattern paper from Playful Pattern Black and White 6×6 pack. Then the Oreo panel on top of the card front using foam adhesives. Thats it. 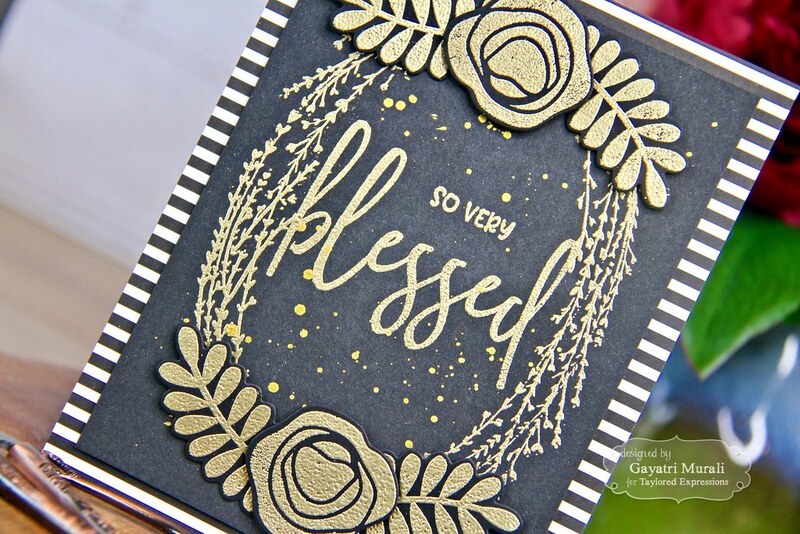 Simple card with classic colour combination and texture from heat embossing. 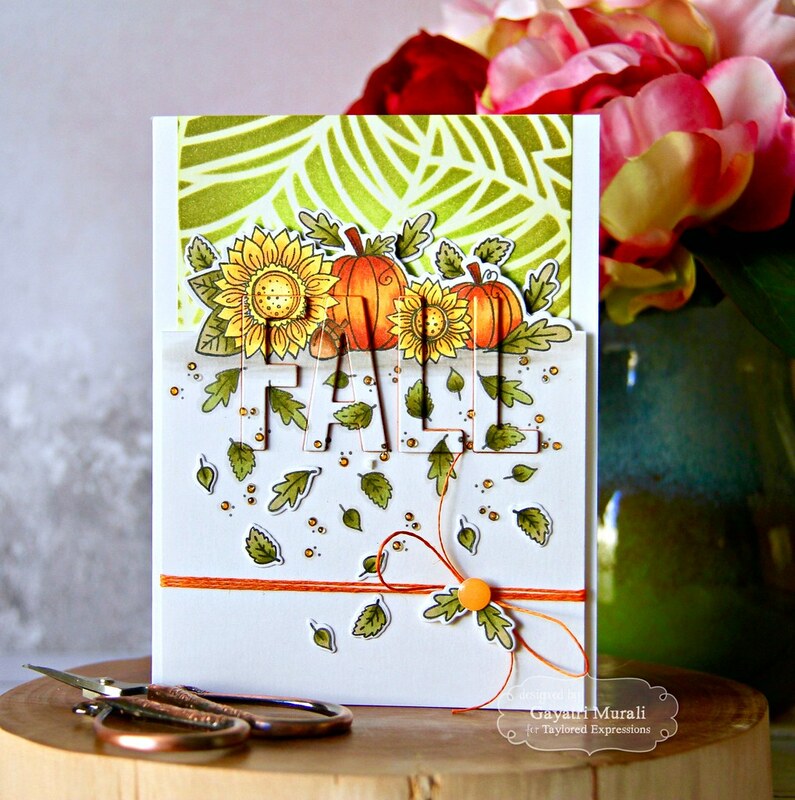 My next project features new stamp set called Cutting Edge Fall along with new Caps Lock Fall die and Mosaic Leaves Stencil. This card is one of my favourite project this release. I love the colours and the design of this card. The top panel is made using sponging Key Lime and Sweet Basil TE dye in on the new Mosaic Leave stencil. 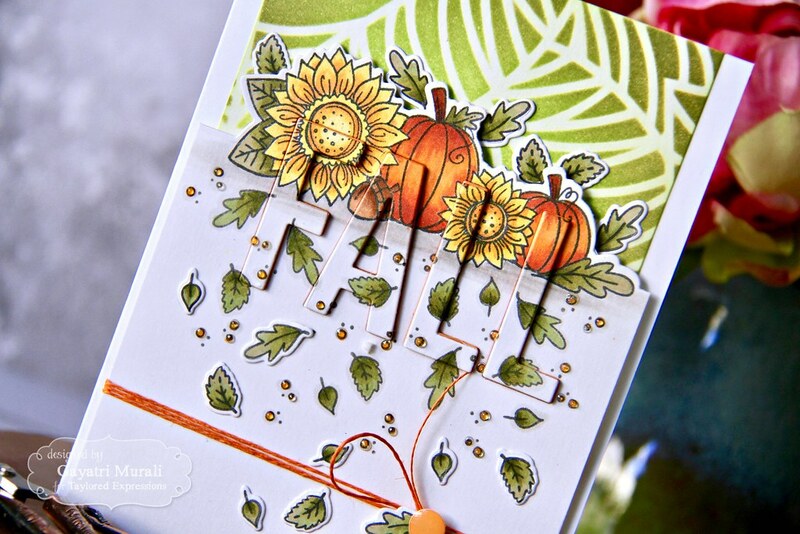 Love the depth the two tone ink sponging gives to the stenciled image. On another panel, I stamped the image from Cutting Edge Fall and coloured the image using copic markers. 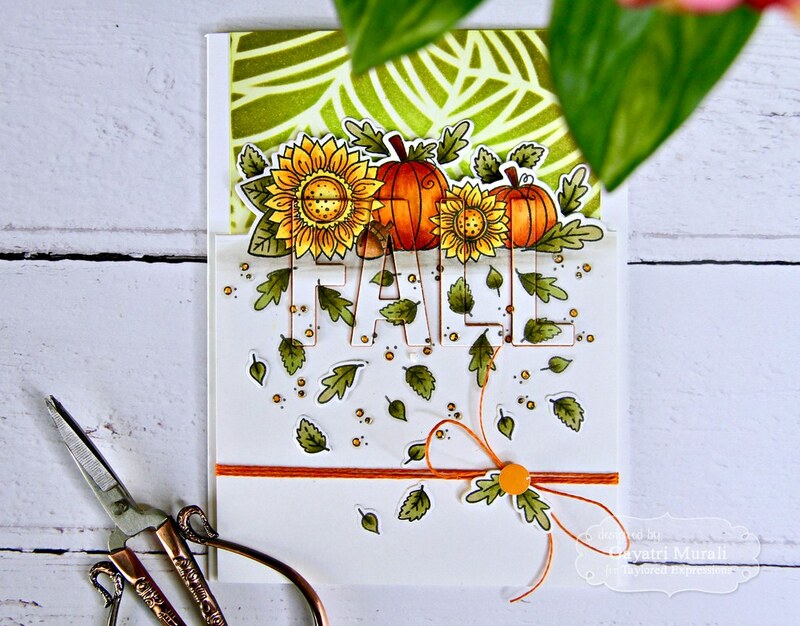 I also stamped the small leaves image from the stamp set below like a scattered effect and coloured using copic markers. I used the cutting edge die to die cut the panel out. I also stamped a few more leaves on scrap piece of paper, coloured and die cut them. On this panel I die cut the panel using the Caps Lock Fall die and saved the pieces. Then adhered a sticker sheet behind the panel. I also die cut three more using Sweet Potato Pie cardstock. I stacked and glued the Sweet Potato Pie dies together and the Fall die cut from the panel on top. I then in laid the stack inside the Cutting Edge Fall panel including the inside bit of “A”. 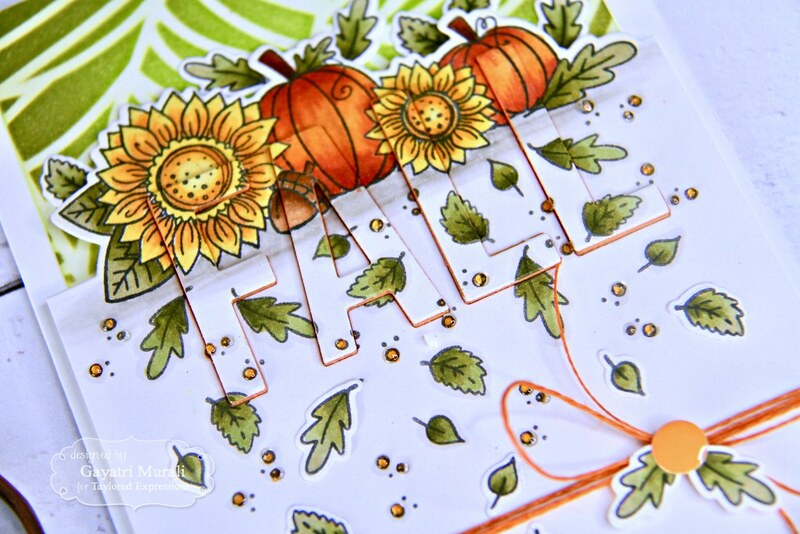 I wrapped this panel with an orange twine, adhered two die cut leaves to the centre of the bow with Candy Corn TE enamel shapes in the middle. I also glued a few more die cut leaves randomly over the panel. This panel is adhered to the card front using foam adhesive to give depth and dimension. The card base is Sugar Cube cardstock. Love the eclipse sentiment on this card. 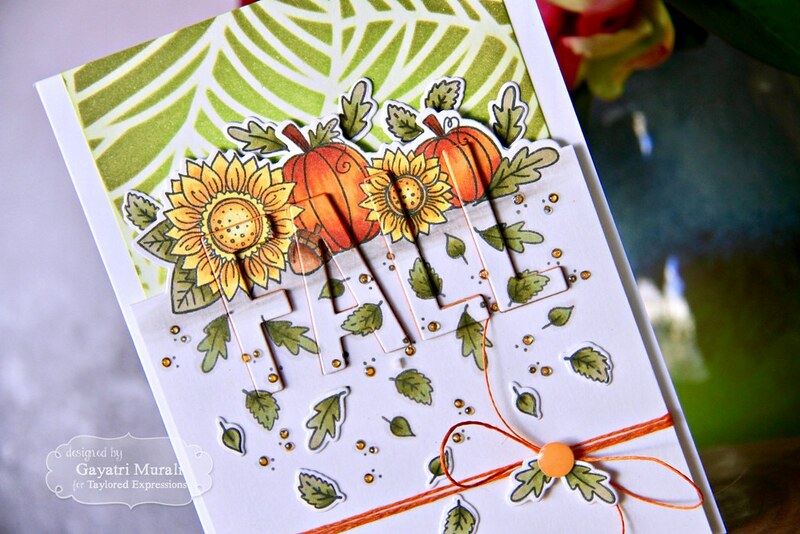 I added a few glossy accent dots and shimmer on the flowers and on the stenciled panel. In real, this card is full of warmth and sparkle. I just could not catch it in my photos. Hope you liked my projects today. 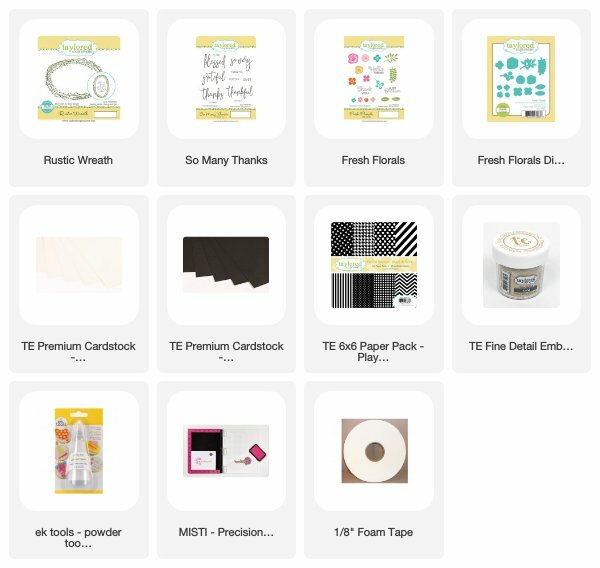 Check out Taylored Expressions Blog for details on giveaway and design team inspirations. I will see you back tomorrow with more sneak peek projects. Have a lovely day! 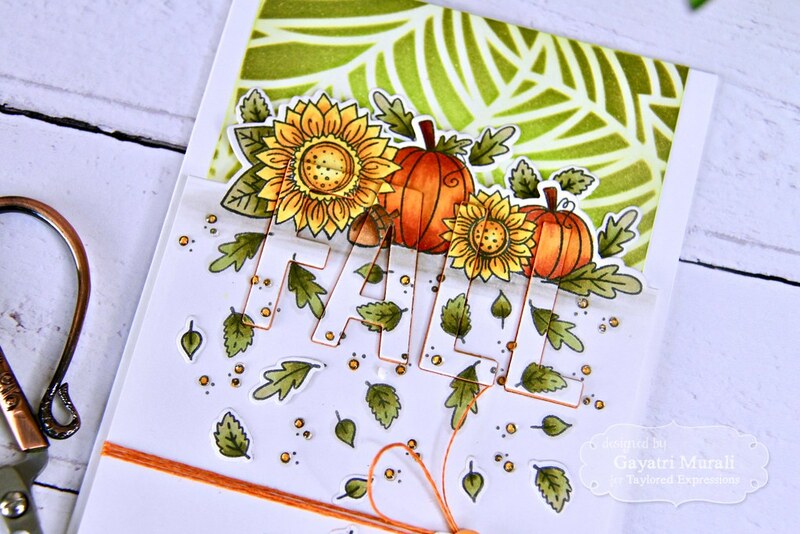 That fall card is fabulous! I love how you stamped over the tops of the 3D letters. Great coloring too!